Four of our TYs (Keelin Tapley, Emily Cathcart, Stefan Simonovic and Belbin Benny) recently attended a presentation day in Prosper Fingal, Skerries, where they learned about the great work which takes within the Prosper Fingal Community. They heard presentations from clinical psychologists and occupational therapists who work in this field and they also met some of the people who attend the Centre on a daily basis. 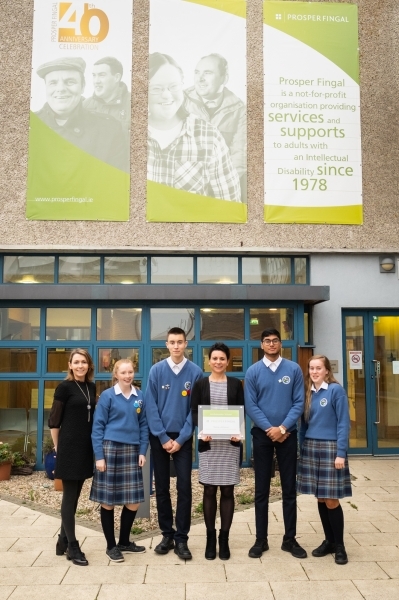 We have now become one of only 6 schools in the Fingal area to be ambassadors for Prosper Fingal. As part of this, the four TY students will do their work experience in the Prosper Fingal Centre here in Balbriggan, they are now trained to give a full presentation to their peers here in Ardgillan on the importance of this Centre within our community and most importantly these students will now be recognized for their work and great efforts to promote mental health and the importance of Inclusion with an Award from Prosper Fingal at our Award Ceremony in May. This we are hoping will continue on throughout the years by our future TY students.